How to Turn a Window Into a Mirror With Less Than $20! Old windows tend to be really easy to find and happen to make some of the coolest decorations! Using a window as a decoration is unique and inexpensive and adds an awesome touch to whatever space you put it into. It is even better because older windows have a natural rustic and vintage look to them that adds really great character into almost any space and at a fraction of the cost of so many other vintage and rustic options. With all that being said, it might seem almost a little odd to just hang up a window on the wall. After all, why would you want to look through a window pane just to see plain old wall being it. That isn’t interesting or unique. Fortunately, there is a really awesome, unique, easy, and even inexpensive way to fix that problem! 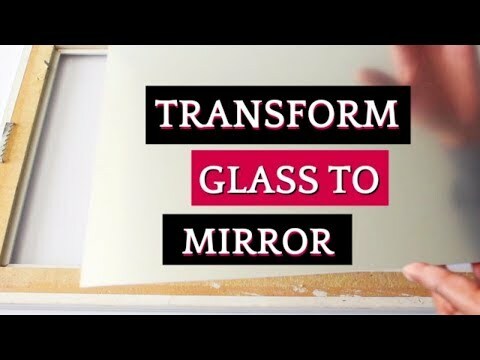 There is a super easy technique that you can use in order to turn any window, or any piece of clear glass really, into a mirror! By turning the panes of an old window into mirrors, you create a super awesome and unique piece of décor that will look great almost anywhere! It adds a really sweet, modern touch to a rustic and/or vintage piece of décor. That means that it really will go great in a wonderful variety of different spaces. The other cool thing about this is that you can use any window to do it. It doesn’t matter how big or small or what shape the window is or even how many panes it has. This is extremely simple to do with literally any piece of clear glass. Since you will be using spray paint, you will definitely want to do this project outdoors. The first thing you will need to do is lay out something on the ground or a table to place the window on top of before you start spraying. You can use a tarp for this, or if you don’t have a tarp, you can use a large trash bag or disposable tablecloth or anything else that you are okay with getting the spray paint on. If you use a trash bag, you can cut the sides open in order to make a larger surface for your window to rest on. Place your window on your tarp or whatever you decide to place down before the window. You will need to clean the glass before you start the process of spraying it. This is a very important step because you don’t want to spray on top of any dirt or smudges because the spray will seal it onto the glass. Sprayway Glass Cleaner Aerosol Spray is a really awesome glass cleaner that is very effective, affordable, and smells great. Alternatively, if you are looking for something more natural, Method’s Naturally Derived Glass + Surface Cleaner is also effective and affordable. Quite possibly the most important thing to remember when doing this project is that you want to spray the OPPOSITE side of the glass that you plan to display. So, if side A is the side you want to be showing, you will spray side B of the window. That means you will clean the opposite side of the glass that you want to display. Once it is nice, clean, and completely dry, you can go ahead and start spraying. It is very important to read the instructions on your mirror spray paint. There are two different brands of this mirror spray paint that are absolutely excellent choices and come in well under $20. Krylon’s Looking Glass spray is super awesome and works incredibly well. It is very easy to use and comes with excellent instructions. Alternatively, you can get amazing results with Rust-Oleum’s Mirror Effect Spray, which is even more affordable at almost half the price of Krylon’s version. Both spray’s have very similar instructions which are extremely important to follow for best results. The first step after you clean the glass is to shake the can of mirror spray paint very well. You will want to shake it for a good 2-3 minutes. After shaking the can of mirror spray very well, you can remove the lid and commence the spraying process. You will want to hold the can about 8-10 inches away from the glass and take your time to make sure you spray the entire glass surface evenly. Spray a single light layer of the mirror spray and then allow it to dry for one minute. At that point, you will spray another layer of the mirror spray paint in the same way. Repeat this at least 3 times, but up to 5 times. Make sure that you do wait the full minute of time between each layer of the spray paint. This will ensure the best results. Since you are spraying the back of your window, it probably won’t matter much if the spray paint is getting on the wood of the window. However, if that is something you are worried about, you can simply cover the wood before you spray. An easy and quick way to do this is by using painter’s tape such as FrogTape Multi-Surface Painting Tape. It not only is very affordable but also comes off super easy once you are done painting.